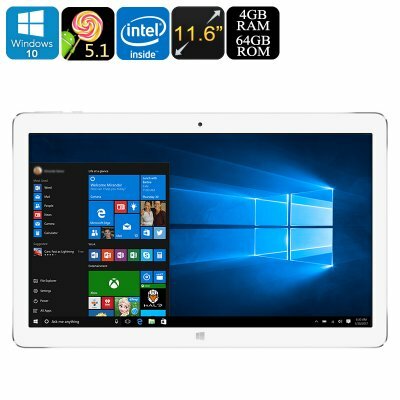 Successfully Added Teclast Tbook 16 Pro Dual-OS Tablet PC - Windows 10 + Android 5.1, Quad-Core CPU, 4GB RAM, 11.6-Inch FHD, OTG, HDMI, Google Play to your Shopping Cart. The Teclast Tbook 16 Pro is a beautifully designed 11.6-Inch tablet that features both a Windows 10 and Android 5.1 operating system. Thanks to its Dual-OS, this tablet PC lets you enjoy all the best features offered by both Windows and Android – guaranteeing a smooth and powerful user experience that will be enjoyed by anybody out there. Android 5.1 brings along plenty of entertainment features and useful applications while Windows 10 lets you enjoy its well-crafted office tools at any time of the day – making the Teclast Tbook 16 Pro a perfect tablet computer for business, study, and entertainment alike. With its Intel Atom X5 Z8300 processor, this Dual-OS tablet is capable of handling the latest of applications, games, and movies without dropping a frame. Built to deliver a powerful yet energy efficient performance, this Quad-Core CPU that has been clocked at 1.84GHz is guaranteed to lift your user experience to the next level. Along with its powerful processor, this Teclast tablet PC packs a stunning 4GB of RAM - allowing you to multitask and enjoy multiple of its features at the same time without needing to worry about slowing down you device. Simply head out to the Play Store and download the latest Apps, movies, games and more to make sure that you’ll never feel bored again. With 64GB of internal memory and 128GB external memory support, this Dual-OS tablet computer packs plenty of space for you to save your favorite media, games, and files alike. On its beautiful 11.6-Inch IPS display, the Teclast Tbook 16 Pro lets you enjoy vivid color and stunning detail. By displaying all your favorite media in mesmerizing 1080p resolution, this Dual-OS tablet PC allows you to take your mobile entertainment experience to entirely new heights. Its built-in 7200mAh battery provides enough juice for you to get through the most demanding of days. With up to 5 hours of continuous usage time, this tablet computer offers plenty of time for you to write up files, make notes, play games, and watch movies throughout the day. In order to lift up your entertainment experience even further, this tablet computer features a micro HDMI slot through which it allows you to connect your tablet PC to your big screen TV. From now on you’ll be able to enjoy all the amazing Windows and Android features this Dual-OS tablet has to offer on a large screen – letting you take the absolute most out of all your tablet has to offer. Additionally, the Teclast Tbook 16 Pro also supports OTG thanks to which you will be able to connect external hardware devices such as a memory pen, keyboard, or game controller to your tablet – significantly increasing your overall user experience. The Teclast Tbook 16 Pro comes with a 12 months warranty, brought to you by the leader in electronic devices as well as wholesale electronic gadgets.. The Android OS and Windows OS versions on this device cannot be upgraded or flashed and any attempts to modify the default OS will void the warranty. As a wholesaler, we provide no software support, advice, or training regarding the Android operating system and software.